Soane's block plan emphasises the symmetrical relationship of the house and its kitchen and stable wings each laid out around a semicircular court. The house plan and elevation are close to drawing 5 except that (elevation) the basement windows are shown and a balustraded parapet has been added as well as three statues on pedestals to each angle of the pediment. 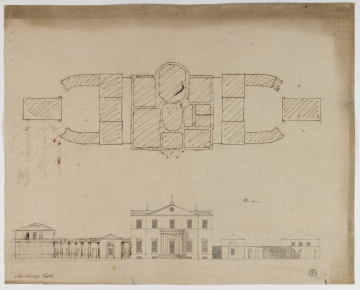 These enrichments to the house proposed by Soane would have been costly and were not carried out. The purpose of the drawing is the finalising of the design for the offices. Each consists of a one-bay pavilion (next to the house) joined by a curved and niched wall to a three-bay, two-storey pavilion with matching niched wall. The left-hand elevation, not fully drawn out, has been amended so that, for example, the niches are framed by pilasters and a frieze added. A finished plan with elevation of the house and offices at the Victoria & Albert Museum (see P. du Prey, Sir John Soane, 1985, in series of 'Catalogues of architectural drawings in the Victoria and Albert Museum', catalogue 110, plate 22)) show much the same design for the house (though without the balustraded parapet and statues) as the drawing catalogued above. The elevations to the offices differ and in particular they are each placed on a slope, giving the house greater eminence and ensuring that the roofs and enclosing walls to the offices defer to the mass of the centre. Visually it would have been a great improvement though the differing floor levels within the kitchen and stables wings might have posed a problem. The idea of a sloping site for the service wings is added in pencil on the right-hand side of the above Soane Museum drawing (22). The V&A drawing is inscribed 26 November 1785 and probably the Soane Museum drawing was made shortly before that date.